Last weekend, in front of over a hundred family & friends, I married my best friend. Thus checking #49 off my bucket list. Contrary to what you might expect, however, this isn’t the end of SailingBo. In fact, it’s actually the beginning of Sailing B+A, as Allison will join me in my dream to spend the next few years sailing. We’ve sold most of her stuff and moved the rest to her sister’s basement in Ohio. Allison’s now a full-time sailboat live-aboard. We’re a week in, and neither of us had tried to drown the other yet. Welcome Mats, Vegetarian Lasagna, and the one we’ve all been waiting for. The one about the Girl. I’m not sure when it happened, exactly, but it did. A few months ago I arrived at the marina after being absent for several weeks. 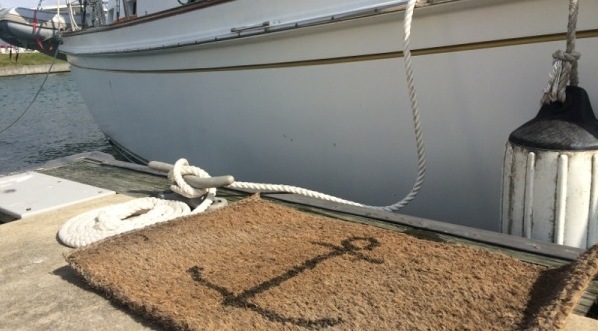 I wiped my feet on the welcome mat before hopping onto the boat, dreading the stale boat odor that would no doubt meet me when I opened the hatch. Only, there was no foul odor. Greeting my nose was a pleasant whiff of peppermint. And since when did I have a welcome mat? The one where I installed solar panels. Once the generator project was finished, I was able to tackle the installation of the solar panels. Back in October we’d purchased (4) 113w semi-flexible solar panels from Aurinco at the Annapolis Boat Show. We opted for the thin flexible type so we could still use the hard-top above the cockpit as a sundeck and diving board. The panels were backordered, so we didn’t get them in the mail until mid-January. As is typical on a boat project, there was a little bit of project creep. As I was measuring up the hard-top to figure out where to put the panels, I noticed a crack in the gelcoat that had allowed water to seep in and rot some of the wood between the layers of fiberglass. Rings. Olympic and otherwise. 2014, the year in review. I’m a bit behind on my year-in-review post, but I’ve done them for each of the past several years, so I didn’t want to leave this year out. It’s certainly been the most pivotal yet. The year started with incredible work opportunities; two bowl games, including the BCS National Championship in Pasadena, then the winter olympics. The. Winter. Freakin. Olympics. I drank vodka in Russia, wine in France, Heineken in Amsterdam, Yuengling in Pennsylvania, and bourbon in Kentucky. I sat in the same room as Vladimir Putin, although he disappointingly was wearing a shirt. I was, however, flogged in a Russian sauna with birch leaves by a man who was not. And I was reminded, yet again, that despite differences in locations, cultures, and governments, people are generally awesome. Bridges, bridge tenders, spontaneity, and second chances. After leaving the boat yard early on Wednesday, I began the 70 mile, 2 day trek back down the intracoastal waterway through the slew of bascule bridges to Charlotte Harbor. Why, I wasn’t sure, but mostly because my car was still at Burnt Store Marina and, well, I didn’t have any better ideas. I dropped the anchor in Sarasota Wednesday afternoon and tossed around the idea of spending a month there at Marina Jack, the uber-nice marina where the boat was when I bought her 2 years ago. But I’d been there and done that, plus they’re pretty proud of their slips, so I charted out the remainder of the trip south on my Garmin Bluechart iPad app. I left at daybreak on Thursday knowing I’d have to get lucky with timing the bridges in order to make Burnt Store before dark. The route would take me under 11 bridges, 10 of which were too short for my 55′ clearance, requiring the whole process of stopping traffic and raising the bridge just so I can pass.